(Natural News) Caterpillars are hungry little creatures. They eat a lot of food and store it as energy for their future transformation into butterflies or moths. While they usually eat plant matter, a BBC article reported that the larvae of the greater wax moth (Galleria mellonella) appeared to eat plastic. An amateur beekeeper found a caterpillar of this species gnawing holes in a plastic bag. Researchers who tested the insect’s ability to consume polyethylene believe that the moth larvae could offer a natural means of reducing plastic waste. The Cambridge University research team explained that the caterpillars usually consume the wax that forms beehives. They found that the insects are also capable of eating certain types of plastics. In their experiment, the greater wax moth caterpillar successfully broke down the chemical bonds of polyethylene plastic. It used more or less the same digestive method to turn natural beeswax into nutrients. Polyethylene is one of the most widely produced and used plastics in the world. It is the material of choice for manufacturing food packaging, shopping bags, and other disposable products. Its durability is a drawback as much as it is an advantage. The plastic can last for hundreds of years before natural processes finally break it up. Given close to 80 million tons of the stuff is produced every year, all that plastic piles up very quickly. What nature takes centuries to degrade, greater wax moth caterpillars can chew through at a much faster rate. The Cambridge researchers sicced the insects on a plastic bag and timed how long it took for them to affect the plastic. It took the larva under an hour to gnaw holes in the bag. They produced ethylene glycol, an organic substance that is used to make polyester fibers and antifreeze formulas. Lead researcher Paolo Bombelli believed that the results of this study serve as a strong launchpad for future research regarding the caterpillar’s secrets. He added that they needed to figure out the specific chemical means by which the insect happily gobbles plastic that would choke or poison much larger lifeforms. 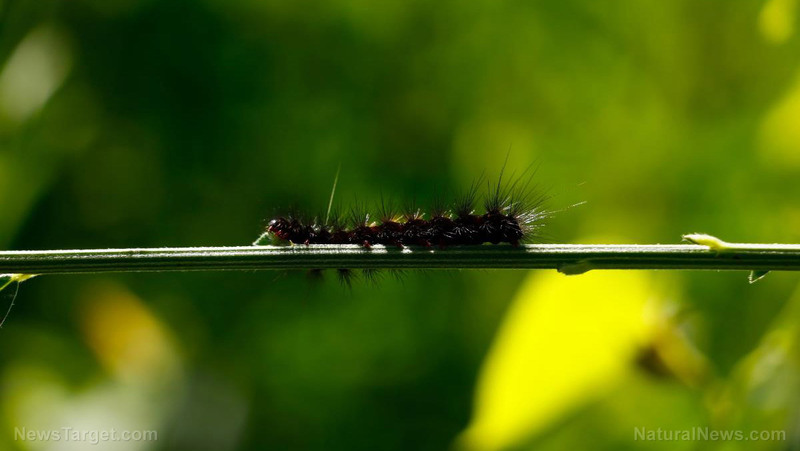 His team theorizes that the caterpillar plays host to several microorganisms that turn polyethylene into ethylene glycol. If these microbes can be identified, they could be studied in action to determine the chemical process by which they break down plastic. Other experts have expressed concerns about the conclusions made by the Cambridge study. They note that a single caterpillar can only consume two milligrams of plastic each day. It would take billions of caterpillars to begin to put a dent into the annual polyethylene output. Furthermore, an article in The Guardian pointed out that the greater wax moth is a destructive parasite of commercially-important honey bees. The caterpillars are known to destroy hives by eating the beeswax. Beekeepers are not going to be pleased by the potential risk posed by the mass cultivation of these caterpillars. Their prized colonies are already suffering from the ravages of pesticides that have reduced native and domesticated bee populations across Europe and the United States. The naysayers do agree that the microbes inside the caterpillars are what truly matters. Other studies have been able to find bacteria that can naturally clean up pesticides and plastics. Find out other ways to reduce the environmental burden of plastic waste at Pollution.news. Next : Can honey products be used to remedy allergic rhinitis symptoms?